Additional inspection of the concrete slab (on- or above-grade) and vertical masonry walls is also necessary to verify that the substrate is solid and suitable for adhesion. Tile contractors, their employees and sub-contractors are responsible for using good judgment in ensuring the substrate is properly prepared prior to proceeding with an installation. 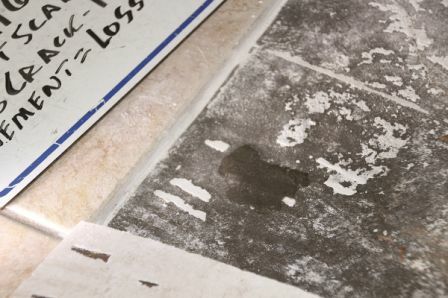 Failure to properly prepare the substrate and accept the substrate in good working condition leads to expensive repairs or into expensive litigation. Concrete slabs and masonry walls must be porous enough to allow moisture to absorb into the substrate to obtain the mechanical bonding necessary for long lasting installations. In order for the concrete slab or masonry wall to be porous, contaminants must be removed. The contaminants may be short- or long-term and contribute to detaching of the assembly. Contaminants such as alkaline salts, cabinet overspray-stains, curing compounds, cutback adhesive, carpet pad adhesive, dirt, drywall mud, dust, excessive carbonation, efflorescence, form release compound, grease, latex and gypsum compounds, mildew, mold, oil, paint, residual adhesives, residual adhesive removers, resinous compounds, spackling compounds, waxy or oily films, wood sealers or a burnished concrete slab finish may serve as a bond breaker. To determine if your substrate has contaminants, pour water onto the concrete slab. If the water beads and does not absorb into the concrete slab, the concrete slab is not acceptable without further preparation. Most tilt-up concrete walls are required to be bead- or sand-blasted prior to proceeding with installation. You can use mechanical abrasion and scarifying to remove the contaminants by using a bush hammer, chiseling, grinding, sand blasting, sanding, scabbing, shot blasting and possibly water blasting. Large projects typically include shot blasting as the most effective and efficient way to eliminate contaminants and penetrated contaminants. Caution: if cutback adhesives (more than 25-30 years old) are the contaminant, then the cutback adhesive may contain asbestos. A rule of thumb ‒ concrete slabs exposed long term or older concrete slabs should be scarified prior to proceeding with installation. If you’re using acid washing or solvents to remove contaminants, know that these products are difficult to control. All acid washing must be thoroughly neutralized, and all acid residue removed. Acid left in or on the substrate will serve as a bond breaker. Solvents used to eliminate contaminants can actually drive the contaminants further into the substrate and serve as a bond breaker in the future. Adhesive removers are similar to solvents. Further, sweeping compounds used on the substrate can leave a waxy or oily film. This too will serve as a bond breaker. Additional inspection of the concrete slab (on- or above-grade) and vertical masonry walls is also necessary to verify that the substrate is solid and suitable for adhesion. Look for cracks, crumbling, delamination, efflorescence, hollow spots, laitance, latex patches, moisture, over watering, saw-cut control joints, scaling, spalling or any loose material. Excessive cracking of a masonry wall, tilt-up concrete wall or concrete slab may indicate the substrate is not suitable for direct bond and may require a mechanical installation assembly or isolated assembly. Next, check the substrate for acceptable tolerance. The maximum permissible variation is 1/4” in 10′ from the required plane for steel trowel and fine-broom finish. Concrete slabs are to be cured before tile application. Curing compounds and other coatings that may prevent bonding to tile setting materials are not to be used for the curing of the concrete. The concrete slab shall be dry at the time of installation. Where the concrete slab does not meet the tolerance requirements, level the concrete slab prior to proceeding with installation. Thin-set and medium-bed mortars are not designed to be used for leveling the substrate. Thin-set mortars may be used up to 3/8” thickness. Medium bed mortar may be used up to 3/4” thickness. The term, medium=bed mortar is being changed to large and heavy tile mortar with maximum thickness recommended up to 1/2” bonding mortar. Thicker installations will require wire reinforcing in the mortar bed. The concrete slab shall be dry at the time of installation. Where the concrete slab does not meet the tolerance requirements, level the concrete slab prior to proceeding with installation. Acceptable tolerance is required prior to: installation of a waterproof membrane meeting ANSI A118.10; installation of a crack isolation membrane meeting ANSI A118.12 requirements; installation of a sound reduction membrane; or installation of a radiant heating assembly. Note: Interior concrete slabs-on-grade require vapor barriers at the underside of the concrete slab and at the edges of the concrete slab. Exterior concrete slabs-on grade require a porous base with adequate drainage. Edges of exterior concrete slabs exposed to moisture, either directly or from contact with soils, require a vapor barrier at the concrete slab edges. Wood substrate preparation includes inspecting the wood to be clean, free of dirt, grease, oil, shellac, varnish, wax, or any other contaminant that might serve as a bond breaker. The wood floor should be designed and installed to meet the L/360 construction code for tile installation and L/720 for stone tile installations. Here’s a simple test: place a glass of water filled to the brim on the wood substrate. Walk around the glass at a distance of three feet. If water comes out of the glass, the floor is not acceptable. Joist spacing for the wood subfloor should not exceed 16″ apart on center. If joist spacing is 24″ on center, then 8″x8″ tiles and larger may only be installed. Caution: Wood-based panels such as particle board, composite panels (veneer faces bonded to reconstituted wood cores), non-veneer panels (wafer board, oriented strand board and other similar boards), lauan plywood, and softwood plywood expand and contract with changes in moisture content and are not recommended as backing materials for tile or stone tile installations. Plywood manufactured with fully waterproof adhesive and with an exposure durability rating of 1 or exterior plywood may be used on residential horizontal surfaces. Where tile is to be directly bonded to the plywood subfloor, one layer of 19/32” plywood installed over one layer of 19/32” tongue and groove plywood. The spacing of plywood sheets should have 1/8” gap and ¼” gap between underlayment panel edges and between all materials which they abut, such as walls, drains and posts. Tolerances for tiles shorter than 15″ is a maximum allowable variation of 1/4” in 10′ with no more than 1/16” variation in 12″ when measured from the high points of the surface. For tiles with at least one edge 15″ in length, the maximum allowable variation is 1/8” in 10′ with no more than 1/16” variation in 12″ when measured from the high points in the surface. Adjacent edges of plywood sheets should not exceed 1/32“difference in height. Acceptable tolerance is required prior to installation of a waterproof membrane meeting ANSI A118.10; installation of a crack isolation membrane meeting ANSI A118.12 requirements; installation of a sound reduction membrane; installation of a radiant heating assembly; or installation of backer board. Where waterproofing is installed, make sure the waterproof membrane is sloped to a minimum of 1/4” per foot in wet areas. Where a thin-set mortar setting bed is installed directly to the waterproof membrane, the waterproof membrane must meet ANSI A118.10 requirements. 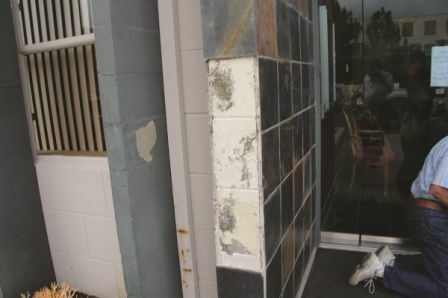 Caution: If sand is broadcast into the existing waterproof membrane, then the waterproof membrane may be the wrong waterproofing membrane for direct bond of tile. In the case of a metal surface receiving tile with direct bond, install with epoxy and verify the metal is properly prepared and suitable for direct bond of tile before installation. If in doubt, consult the latest edition of the Tile Council of North America Handbook for Ceramic, Glass, and Stone Tile Installation and/or ANSI A108, A118, A136 American National Standards for the Installation of Ceramic Tile. Where surfaces are not acceptable, contact the party to which the contract is with for correction of the substrate in question. If told to proceed, get statements in writing from the party indicating you have been told to proceed over unacceptable substrates. Proper inspection and acceptance of the substrate is very important. 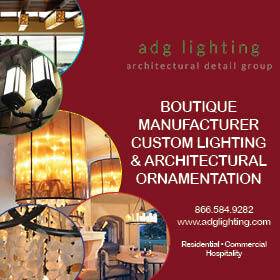 Always work toward successful installations.